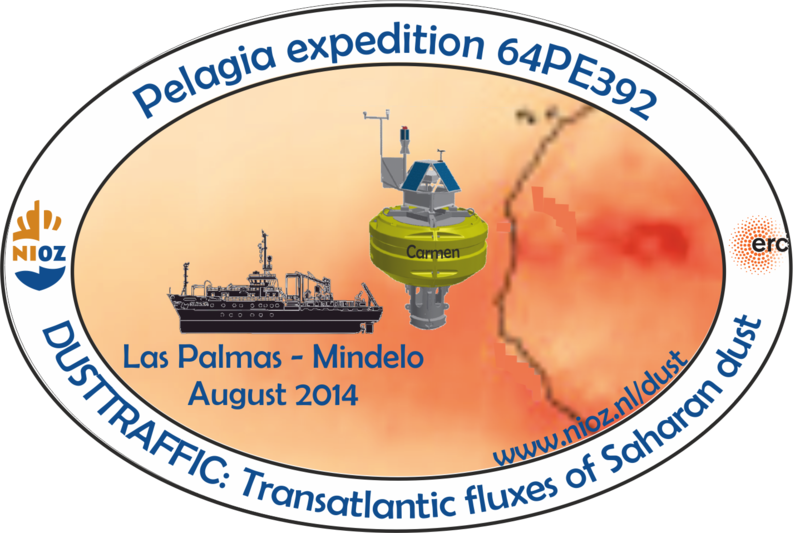 In August 2014 we sailed onboard RV Pelagia from Las Palmas (Spain) to Mindelo, Sao Vicente, Cape Verde Islands. In August 2014 we’ve set sail again to collect Saharan dust from the very first dust-collecting buoy Carmen, which had been deployed in November 2013, and which had been collecting dust since then. This was the first time we’d see how well the buoys perform. Below you’ll find an impression of this trip, which took of in Las Palmas de Gran Canaria (Spain) and ended in Mindelo, Sao Vicente (Cape Verdian Islands). Dolphins frolicking in the bow wave! Since November 2013, the buoy had been sending messages twice daily containing info on its position, sampling status and weather. Here you see how the buoy has the freedom to move in a circle around the anchor stone of about 5km. The NE trades ensure that the buoy spends most of its time in the SW corner. As the buoy has a flasher, it can be seen from a distance of 4.5nm already! For this reason, we aimed at getting visual contact around sunrise. Here you see a happy Bob and even happier me to see buoy Carmen next to the ship. Excellent timing: just that morning, the wind had decided to slacken, giving Jan-Dirk, Fred, and Martin the opportunity to attach lines to the buoy, using the MOB boat, so that the buoy could be hoisted on deck. 3 tonnes worth of buoy and who knows many added kilos of mussels that have attached themselves to it, need careful treatment; bosun Ger and chief technician Yvo have it all well under control, so that Martin can watch with his hands on his back. Interesting biology on the buoy and interesting things on/in the line: bigh fish hooks and lamps to lure fish. Fortunately, this time the line was sturdy enough to not be cut through. To be sure we added another 10m of steel chain; no hook is going to cut that! These two pictures sum it all up quite nicely; the front (upper image) and back of the Vaisala weather sensor (lower image). As the buoy’s wind vane keeps it oriented into the wind, only the front of the sensor is covered in dust. The weather data, together with the collected dust (the real stuff happens inside the sampler of course, where dust is collected on filters)are unique in the world and will hopefully answer a lot of burning questions related to Saharan-dust transport and deposition. Just out of curiosity, we added a MWAC (Modified Wilson And Cook) sampler, giving us quite a yield of dust and water: a 10-months’ average! This, however, is what makes us really happy: a full filter that collected Saharan dust during only 7 days! The dust was collected in sync with a sediment trap, managed by colleagues in Bremen, so that we can compare what’s flying through the air€� with what’s sinking through the water column€�, hopefully giving us clues about the fertilizing effect of mineral dust. To minimize the risk of fish hooks cutting our lines, we added additional steel chain. With a complete new tower, buoy Carmen is being re-deployed. Wishing buoy Carmen good luck, nice weather and LOADS of dust! See you next year!